©1941 William L. Shirer (P)2011 Blackstone Audio, Inc. If you found "Rise and Fall" to be a gripping book, as I did, then I think you will find "Berlin Diaries" to be a wonderful listen. Here you learn all the thoughts of a witness to an amazing place and time. Particularly striking is the insanity of what Shirer is and is not allowed to report. The world was turned upside-down and Shirer tells you about it as if you were having a drink at the press club. Wonderful insights into easy things that the British might have done better... for example, bombing doesn't need to be massive to be effective, Shirer explains that even small bombings during the night in Berlin have the effect of keeping everyone awake and dramatically affecting war production, not to mention jangling nerves. You see Shirer becoming more and more cynical as the war begins to go badly and his access to real news vs. propaganda is limited. The book leaves you wanting to learn a lot more about his wife Tess who seems like a very interesting character in her own right. Shirer explains so clearly successes of the Third Reich early in the war; you understand what it means to build a war machine, to consider all the technical details, to keep all your aircraft hidden a short distance from the airfields so that the bombing of an airfield produces limited damage. Shirer explains Hitler's misperception of British attitudes. I found the book truly fascinating. This diary of William Shirer, published in 1941, provides an unfolding of Europe's plunge into war from 1934-1941 by an American reporter who recorded these events as they happened while he was there during this period. Shirer proved insightful as to what the Nazi's were up to as France and Britain failed to stand up to Hitler's string of demands for more of Europe's land. The narration is excellent as he reads Shirer's diary entries and you feel like you are back there in time listening to the events unfold as Shirer describes them. At first I lamented Grover Gardner was not the reader, having found Mr Gardner's reading of 'The Rise and Fall...' excellent. And initially Tom Weiner's pace was too fast for my idea of a 'Journal' reading, my ear adjusted and the content became dominant. OK I am not an historian and I did not study modern history at school. As I listen now, I am having to adjust my understanding of so much that was going on in Europe prior to the official start of WW11. Being a journal the immediacy of events as they unfolded is giving me a whole new picture. I have seen the movies, read the fiction and seen some of the propaganda films released by The Allies, Take on that this is a journal, written as events were being played out and the reflections of William L. Shirer are truly an eye and heart opener. One feels the frustrations and disbelief that leaders at the time behaved as they did. I am still listening, and so impressed by this 'Berlin Diary" that I can only highly recommend this to any with an interest in World War11, to learn how so important our Journalists are, when free of censorship from government and employer. What did you love best about Berlin Diary? What other book might you compare Berlin Diary to and why? If you could sum up Berlin Diary in three words, what would they be? "All the President's Men." Although it is non-fiction it reads like a mystery thriller because it's fast paced, the characters are real and as hard as it is to believe that our government and its leader(s) could be so deceitful and cunning, it really happened. I loved his voice, it is easy to listen to and he doesn't overact; however, you can tell by his inflections that he is relaying the author's mood. A front row seat to history. I have read a lot about the Nazi regime and it's march to total war; however, William Shirer's writing brings it to life. I have always wanted to read "The Rise and Fall of the Third Reich" but the length of the book put me off because it seems I never have enough time to tackle it. After listening to "Berlin Diary" I decided I had to listen to "Rise and Fall.." to hear the complete story. I am now listening to it and I'm totally fascinated. My husband and I just took a round trip by car that took a total of 10 hours and we never said much to each other because we were immersed in the story. "Berlin Diary" is a great way to segue into the full story and what a great history lesson. So I am on my second go around of this audio book. I loved it, very detailed, interesting, and greatly narrated. I recommend it for anyone who might be interested in a little behind the scenes action of 20th century Europe. Where does Berlin Diary rank among all the audiobooks you’ve listened to so far? I am a post-graduate history student and a World War II fanatic. This is in my top 5 audiobooks. It is a first-hand account of living under the Nazis. Have you listened to any of Tom Weiner’s other performances before? How does this one compare? Tom Weiner is fabulous, although he pronounces "short-lived" as if it rhymes with "short-dived". Personal and personable account of the nazi rise. 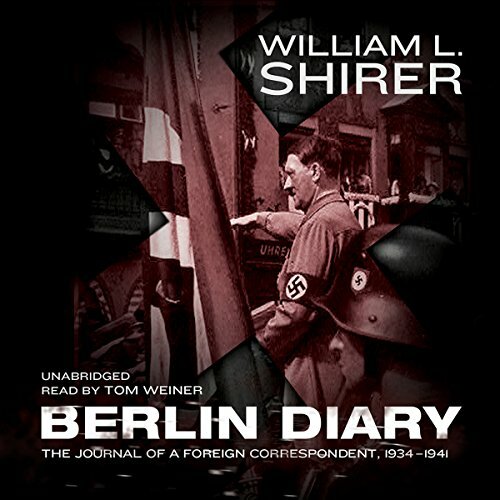 Berlin diary presented a firsthand experiential account of the rise and conquests of Nazi Germany by Shirer, who was actually there (in Berlin and various other relevant locations) at the time. Presented in diary form, the story unfolded as events happened and became known to Shirer, rather than a narrative by one who already "knew how it would end". The "voice" of Shirer, the personable way he wrote, the little extras of almost irrelevant diary writings. What three words best describe Tom Weiner’s voice? No. The diary form made it approachable over a period of a couple of weeks. If you have a slight working knowledge of the Nazi rise to power, this is an amazing document. And since it's a diary being read, it's perfect in Audible form. Don't miss this!! If you're not quite up to snuff on your European Nazi history, listen anyway. That's what the pause button and Wikipedia is for! This reading reminds me of the 9/11 air traffic control tapes, available on YouTube. History in real time. Frightening and maddening. Perfect narrator and narration. PLOT: a newsman's view of Nazi Germany from the inside. I had read bits of the book years ago but I had forgotten how compelling it was. Shirer's day-by-day picture of life under the Nazis is uncannily accurate with the hindsight of history. He wrote beautifully although his growing loathing of the Nazis makes the later parts of the book more tirade than report -- loathing the Nazis was, of course, justified but I wish Shirer had tried harder to understand why otherwise-rational Germans didn't share his hatred. He often resorts to sweeping stereotypes about "the German character" and he fails to pursue insights on the Nazi use of class resentment and modern media. Still, worth every minute of listening and the reading adds extra resonance to every sentence. What made the experience of listening to Berlin Diary the most enjoyable? I had the book on my reading wish list, and when I saw it was available on audible I took a chance. It was wonderful, and as I do most of my listening on the bus to and from work, the 'bite sized' chunks that a diary affords, made it perfect for my commute. Historically it is fascinating to hear what someone living in Berlin at the time thought - I had read that it didn't really address the issue of anti-semitism and genocide; but I felt that it did. Maybe not to the detail that we now know, but it was made clear that journalists were not being given all the information they required. Have you listened to any of Tom Weiner’s other performances? How does this one compare? I haven't listened to any of Tom Weiner's other performances but I most certainly will now. I only wish that William Shriver had stayed longer in Berlin - although he of course didn't want to! This story is best listen to with a good Knowledge of the events. As a diary the author of course does not know what will happen next so some of the accounts are based purely on his own interpretation of the situation and was some times incorrect. This is not a criticism as it actually shows how isolated the German population where from events outside there own country much like North Korea today. Every book written about World War 2 is started by an author who knows the outcome so this is a unique account in every way. Don’t expect a traditional structure to this book and you'll be fine. There is a lot of everyday detail in this account that does not appear in the Rise and Fall. A great listen. Well worth listening to for anyone interested in the second world war. I liked the fact that it was written at the time, so without the benefit of hindsight - and William Shirer got a lot of things right about how countries would fall to the Nazis. He also showed how the German tactics were the same, country by country, which I hadn't known before. An amazing journey through a time we rarely hear about. A completely new perspective on the war and the litany of errors made before it even started. Excellent content and well read. With the exception of In The Garden of the Beasts you will not find a better account of Germany during the first 8 years of its existence. incredible insight to life in berlin during the outbreak of war. saw it from the front seat. History as it happened. The frustration of Shirer in not being possible to broadcast the full truth about what was happening is plainly evident.